KIEV, Ukraine -- Prime Minister Mykola Azarov, after recently seeing a final draft natural gas agreement with Russia, has refused to support it, voicing concerns over the country’s energy security, Dzerkalo Tyzhnia newspaper reported Saturday, citing a source. Ukraine Prime Minister Mykola Azarov. The agreement, which apparently required political and economic concessions and was mainly negotiated by Energy Minister Yuriy Boyko, had been directly supervised by President Viktor Yanukovych. Azarov was shown the final draft at a two-hour meeting with Yanukovych on December 5, after which Azarov had returned to the Cabinet of Ministers in a very bad mood. 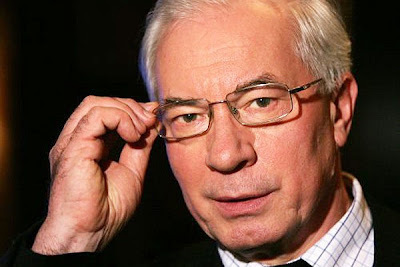 Azarov was “madly enraged and concerned,” the newspaper reported, citing the source at the government. Two days later, on December 7, Azarov ordered the government to prepare the “toughest variant” of the 2012 budget, anticipating high Russian gas prices of about $400 per 1,000 cubic meters in 2012, the newspaper said. “This may indicate that on the Russian-Ukrainian gas front, where a close amicable agreement has been announced, some complications have emerged,” the newspaper reported. Volodymyr Ariyev, an opposition Our Ukraine-People’s Self-defense group lawmaker, last week accused the governing Regions Party of preparing to surrender control over Ukraine’s gas transportation system to Russia. Gazprom, in a statement released after a meeting between its CEO Alexei Miller with Boyko in Moscow on December 5, said the agreement will “probably” be signed before the end of the month. Ukraine had been seeking since April 2010 to persuade Russia to lower its gas prices, but was only able to make progress following a meeting on September 24 between Yanukovych, his Russian counterpart Dmitry Medvedev and Russian Prime Minister Vladimir Putin in Moscow. At the meeting, Yanukovych suggested that a tri-lateral consortium be created between Ukraine, the European Union and Russia to operate Ukraine’s natural gas transportation system, according to a person at the Yanukovych administration. Each party would have an equal stake of 33.3% in the consortium. But Russia has apparently refused, suggesting instead forming a bilateral consortium without European companies, involving only Gazprom and Naftogaz Ukrayiny, according to a person in Gazprom. Neither Ukraine nor Russia have officially commented on the nature of the talks. Ukraine was seeking to reduce the gas prices to $220-230 per 1,000 cubic meters, down from about $401/1,000 cu m currently, according to a source in the Ukrainian government. Ariyev said the agreement will keep the lower prices trough the end of the next year, after which the prices will continue to grow again, allowing the pro-government parties perform better at the parliamentary elections in October 2012.